So for those of you who haven’t been reading comics lately, or have never at all, most likely have one name in mind when someone says: BATGIRL. Obviously, Barbara Wilson, Alfred’s niece. Right? From the critically acclaimed cinematic masterpiece, Batman and Robin…..wait….no….well, it was a piece of something. No. No. No. You think of Barbara Gordon, Commissioner Gordon’s daughter. Whether if was from the 1960s Batman TV show, played by the elegant Yvonne Craig (one of my first crushes) or the Barbara Gordon from the Animated TV show, voiced by Melissa Gilbert. If that’s the case you’ve been out of it a bit, and that’s okay. Welcome back or welcome for the first time. 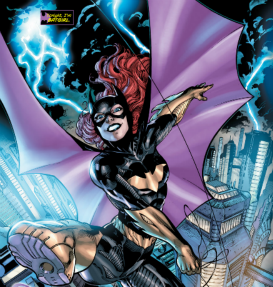 Just to bring you up to speed there have actually been FIVE Batgirls, Barbara Gordon actually being the second. In 1988, Alan Moore wrote a one-shot graphic novel entitled, “Batman: The Killing Joke”. In it, The Joker finds Barbara Gordon and shoots her, piercing her spinal column and causing paralysis. Barbara went on to remain in a wheelchair, but became the most powerful hacker in the DC Universe with the new name of Oracle. 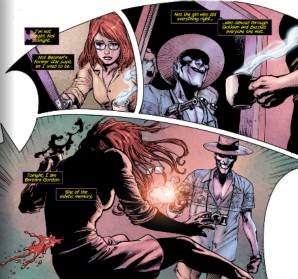 In the DC Comics “New 52” continuity the events of “The Killing Joke” occur. However, this time Barbara survives the ordeal with the use of her legs. We pick up with Batgirl/Barbara Gordon 3 years after the Joker’s attack. 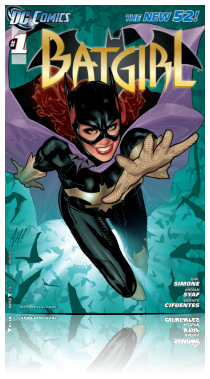 Barbara is just getting back into action as Batgirl and we follow along as she takes down a group of killers who are murdering sets of families. Gail Simone and Ardian Syaf work really well together to create an exciting action sequence filled with Barbara’s inner monologue. It’s youthful, energetic and fun to read and watch. This is carried through out the entire comic including a touching father/daughter scene between Barbara and Commissioner Gordon, A fun first meeting of Barbara’s new roommate & an eerie introduction of a new villain. Special mention goes out to the way in which Simon and Syaf handle Barbara’s nightmare regarding her attack 3 years ago and the ramifications it has on her in the present. Definitely check out this first issue, I’m sure you’ll come back for more. I know I will be. "..this time Barbara survives the ordeal with the use of her legs." This isn't exactly accurate, she still has spent time as a paraplegic, she only recently regained her ability to walk. Otherwise, solid review.